We offer a variety of products to meet your healthy lifestyle needs. We can clean your air of allergy and asthma triggers, dust, bacteria, kills germs, mildew an mold, smoke, pollens, toxins, dirt and dust mites. Please check out other posts for your specific air quality need. Great to use when you are away from electricity for an extended time. This is a personal purifier worn around your neck. It keeps allergy and asthma triggers out of your breathing space and stops germs before they get to you. Watch this video to see how it works. It has separate batteries to recharge for continued use. 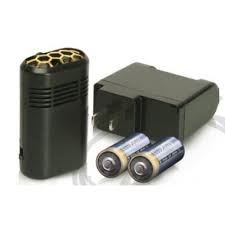 Extra batteries can be purchased for long time use beyond 8-10 hours. The Fresh Air Surround cleans the air in your home, office, car, and more. It is a portable unit that sits in the room you spend the most time. It works in conjunction with your furnace filter system. Not only does it remove dust from the air, but it removes the allergy triggers such as pollen, pet dander, and the particles from chemicals and toxins, and the dust that comes indoors with you. The Fresh Air purifier removes unpleasant odors. This unit cleans up to 3,000 SF (upstairs and downstairs). Today’s modern indoor environments are rife with contaminants. The FreshAir Personal provides nature’s own powerful properties with a built-in ionizer that attracts free-roaming particles and captures them, reducing allergens and pollutants that invade the space you breathe. The FreshAir Personal creates an almost particle-free zone around the wearer by generating high intensity ion streams that add charges to nearby airborne particles. Watch the two videos (found on this website): The technology is the same in all the Fresh Air Purifiers we sell. Contact Active Healthy Lifestyles diana@activeairpurifiers.com to help you select the best Fresh Air Purifier to meet your needs. Purchase your Fresh Air Purifier following the demonstration and/or determine the best date for your purchase. Monthly specials only apply to purchases made directly from Active Healthy Lifestyles. 3-Day Money Back Guarantee apply to purchases made directly from Active Healthy Lifestyle. Buy online. You can purchase directly from the manufacturer. Use my name, Diana Hoffman and my number is 800889. That way I get credit for the sale. I can provide you with information and help you with any problems that you may have. Daily rental of our Fresh Air Surround is perfect for removing odors such as smoke, skunk, stale air, cooking odors, and the list goes on. This is especially useful for those renting or selling a home or moving into a home or rental that has odor issues. Minimum rental is 24 hours. You can save by picking up unit from the Active Healthy Lifestyle’s office. Daily rental can be applied to the purchase of a new purifier if purchased within 7 days. If you purchase between days 8-14, one half of the rental price will be applied to your new purifier. This does not include delivery charges. CONTACT ME FOR RENTAL OPTIONS!